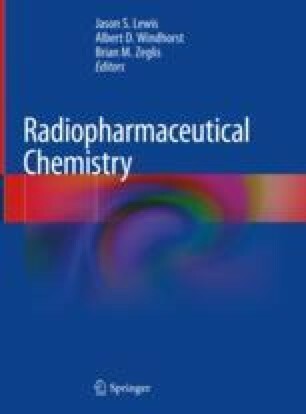 The preceding chapters of this book have explored the chemistry and radiochemistry of several radionuclides used in the design of radiotracers for diagnostic imaging and targeted therapy. These ‘common’ radionuclides – such as carbon-11, fluorine-18, copper-64, gallium-67/gallium-68, zirconium-89, yttrium-90, technetium-99m, indium-111, radioiodine, and lutetium-177 – are the mainstay of nuclear medicine. Their chemistry is diverse, yet collectively, they represent only a small part of the radiochemical landscape. The National Nuclear Decay Center contains detailed information on the physical decay properties of more than 3175 extant radionuclides, with many more that have been predicted to exist but have yet to be discovered. Traditional synthetic chemistry is built upon ~253 nuclides that are classified as ‘stable’. But what about the other ~2900 radionuclides? In this chapter, we will explore the chemistry and radiochemistry of several alternative radionuclides which, based on their decay properties, show promise for future radiopharmaceutical applications. The discussion of these ‘seldom-used’ radionuclides is organized according to the classical groups of the periodic table and includes sections detailing the emerging radiochemistry of promising radionuclides of scandium, titanium, manganese, arsenic, niobium, terbium, and erbium. JPH thanks the Swiss National Science Foundation (SNSF Professorship PP00P2_163683), the European Research Council (ERC-StG-2015, NanoSCAN – 676904), the Swiss Cancer League (Krebsliga Schweiz; KLS-4257-08-2017), and the University of Zurich for financial support.